This group is affiliated to the Kiwanisinternational organization and servesboth within the college and the outsidecommunity. The aim of this service club is to render altruisticservice, to build better communitiesand develop character. The objective of the 4H is to build community and skills through agriculture, focusing on value added products while developing agricultural practices and skills. This club aims to enhance students’ awareness of the work of the United Nations. It is open to students who are interested in learning about the work of the United Nations and international issues such as environment, poverty eradication, culture of peace, human rights, eradication of diseases, drug control, and cultural patrimony. In coordination with the United Nations Information Centre, a teacher plans and directs the club’s activities, which may include educational workshops, roundtables, video screenings, exhibits, or competitions (essay writing, painting and drawing, photography, etc.). The Robotics club focuses on Computer Science, engineering principles and inculcating social skills among team members. The club exposes students to the ideas of creating programmes and designing robots based on guidelines stipulated by competition bodies in the United States of America. This club was established to ignite the spark and creativity in our students. Students engage in different science experiments and Science based competitions. The intent of the Art and Photography Club is to bring together students from all walks of life to enjoy a similar passion of creating and discussing art. The intent of Digital Art is that students’ output would feed content for the social media channels and the website. A society which debates current issues and topical issues on a wide range of subjects from social to economic and legal issues happening in the world. The aim of the Drama Club is to promote and facilitate the artistic expression of self while providing entertainment and recreation for the College Community. This club is aimed at promoting an awareness of dances of varying cultures. Students develop both physical and mental fitness through discipline, hard work, cooperation and training. 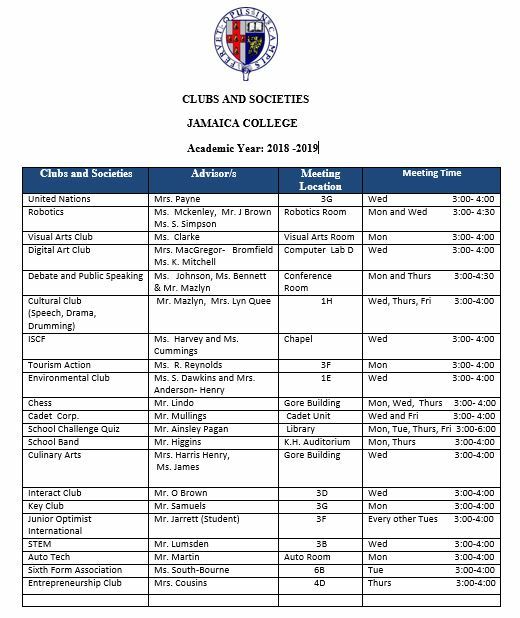 This club aims at managing the affairs of the sixth form students at the college and ensuring leadership roles are carried out by members of the student council body. The Computer Club aims to bring together students and faculty interested in the field of Computer Science to share their knowledge and experience in computers. The aim is to develop the writing and oral skills of its members and prepare monthly newsletters. A Christian group engaged in spiritual activities with the aim of encouraging spiritual development on the campus. The objective of the Math Club is to develop students’ critical thinking skills and to establish a love for the subject. The aim of the College Choir is to provide opportunities for creative expression and recreation for the individual and the College community. The Tourism Action Club is designed to encourage a greater awareness of tourism related issues. TAC activities are based on community involvement, education and recreation. This club aims to develop within students a facility in the languages and a love for Spanish culture. The aim is to instill in its members a sense of nationalism, pride and identity which will help to consolidate their legacy in the future. The purpose of our Chess Club is to teach the game of Chess to individuals who are not able to play; and to sharpen the skills of those students who already know to play. Chess is a competitive board game in which players develop analytical and problem solving skills; while building their concentration levels. The Octagon Club is an active youth service organization whose main goal is to promote positive change in its community. This group is designed to facilitate a more caring sharing and responsible atmosphere among students who out of respect, concern and an understanding of life’s challenges respond willingly to each other. Jamaica College Cadet Corp equips students with discipline and training, so that they can become productive members of society. This is a group of instrumentalists, who perform at the college for various functions as well as in the different competitions. This club engages students in many fun activities and allows them to entertain the school community and engage in competitions such as the JCDC Festival Competitions. This group is the link between the student body and the faculty. Student representatives are chosen from each class and are the voice of the student body. These students are active and functional in school life. The Anime Club meets to discuss, show, and promote anime among club members and also focuses on broadening Japanese cultural understanding. In addition to viewing anime, clubs engage in other activities such as viewing anime music videos, reading manga and sketching anime. The aim is to sensitize students about new and emerging technology in the automotive sector. Designed for students to learn both theory and practical skills in the field of culinary.